AUSTIN, Texas – No. 3 Texas Volleyball (22-1, 14-1) defeated Kansas (20-8, 8-6), 3-0 (25-20, 25-23, 20-18) on Saturday afternoon at Gregory Gym. The sweep marked the Longhorns' 14th of the season. Senior Haley Eckerman led UT with nine kills, while junior Molly McCage led with seven blocks. McCage also recorded seven kills, as did senior Khat Bell and sophomore Paulina Prieto Cerame. Freshman Cat McCoy and junior Amy Neal finished with double-digit digs with 11 and 10, respectively. As a team, Texas out-blocked Kansas, 11.0 to 6.0 and out-hit the Jayhawks, .238 to .154. In the first set, Texas and Kansas traded points, with neither team leading by more than two points, until McCage had three-straight kills and two blocks to execute a 5-0 run and take a 15-10 lead. The Jayhawks fought back to get within two at 18-16, but the Longhorns went on a 4-1 run and didn't look back to win the set, 25-20. Kansas jumped out to a 3-0 lead in the second set, but Texas retaliated with a 6-0 run to take an 8-4 advantage. The Jayhawks fired back to take an 18-17 lead and the teams stayed close, tying at 23-23. From there, UT won two-consecutive points to take the set, 25-23. It was all Texas in the third set, as the Longhorns jumped out to a 5-1 lead early and led by as many as seven at 18-11. 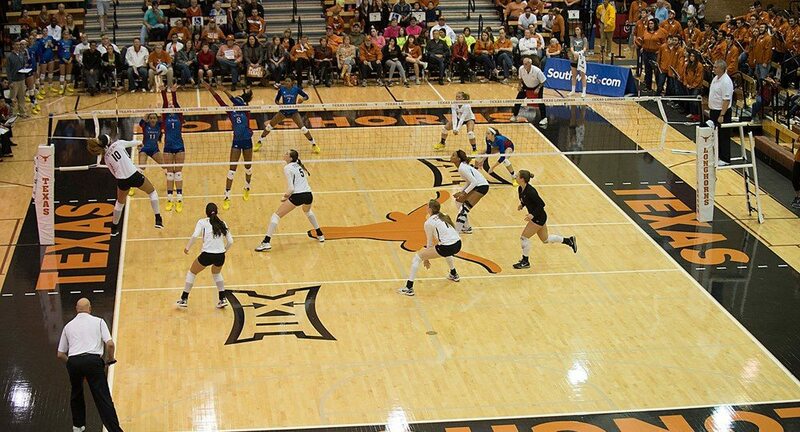 Kansas fought back, but could not narrow the gap and Texas took the set, 25-18 and the match, 3-0. Chelsea Albers led the Jayhawks with 16 kills and 11 digs. The Longhorns will hit the road again on Wednesday, Nov. 25 to take on TCU in Fort Worth, Texas at 7 p.m. CT.
On winning the first set: It's always really important to be able to come out and execute at a high level. It puts a lot of pressure on them. You know if you are going to win game one and game two, then it's a tough climb up the hill. So if you lose game one, it's always a challenge. I just felt like they were ready to play today. It was one of our best serve-and-passes we've had in a while. They were taking good swings; I think they put a lot of respect into this team. It's the first time we really played consistently all the way through for a while and it's nice to see it this time of the year. On calling a time out in the third set: I told them, I think this is the first time all match that we are just kind of, not executing at a high level, just kind of cruising a little bit more. Just wanted to make sure that we finished as strong. They were able to do that and play well. On being the Big 12 Champions and their trophy: It means a lot. I don't know if people take it for granted, but it's very hard to win when you play a double round robin and the way that we performed and had our backs against the walls some matches were we have come through. It takes a lot of work and these girls have put the work in since the summer and stayed here and committed to themselves. All the things we do behind the scenes to be successful is seen now with the trophy. On where the team stacks up nationally: You know I told them actually before the game, I said I have been watching a lot of film and there is a lot of parity within the game. I don't think we need to be perfect every single time, we just need to go out and play and find a way to win each match. We feel like Kansas is a Sweet 16 caliber team, they are right there in the RPI to be that. We are going to focusTCU on Wednesday and then Florida is going to probably be a top-eight seed so we will have an Elite eight team after that. So the way that the schedule is set up bids well for us. These guys put a lot of thought into it and prepare, they have a lot of confidence in what they can do and believe in themselves and they have been in a lot of these battles.